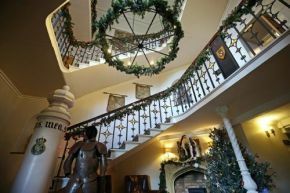 Leasowe Castle is set to warm up the Wirral Peninsula this winter with its fabulously festive package. The 16th-century venue has launched the offering comprising overnight stay with breakfast, perfectly paired with gloriously festive Afternoon Tea. Available until February 28, the package is guaranteed to leave guests feeling like Kings and Queens of the castle throughout the cooler months. General Manager of Leasowe Castle Mike Dewey said: “Here at Leasowe Castle, our exclusive package offerings prove ever-popular with our guests who are looking for a unique chance to relax and unwind. The castle is home to the exclusive Brasserie 1593, where both classic and contemporary dishes are served to hotel residents and non-residents alike. The recently refurbished Wreckers Bar offers the ideal location for guests to enjoy a selection of classic and contemporary cocktails in glamorous surroundings. The ‘Winter in the Castle’ package is priced at £105 inclusive for two persons from Sunday-Thursday and £135 for two persons on Fridays and Saturdays. Subject to availability based on minimum two persons sharing.